Around 18 people died while waiting in Indonesian traffic in a 20km queue ahead of the Eid al-Fitr festival to end a month-long Muslim holiday. The deaths in Brebes, Java, started on July 3 as millions converged around a toll exit while heading home for the end of Ramadan. Roadside vendors and crowded markets added to the problem as did rubbish from stranded motorists. Scavengers arrived to look through the waste for recyclable materials. Most victims were apparently elderly who overheated. The authorities said exhaust fumes poisoned a one-year-old. 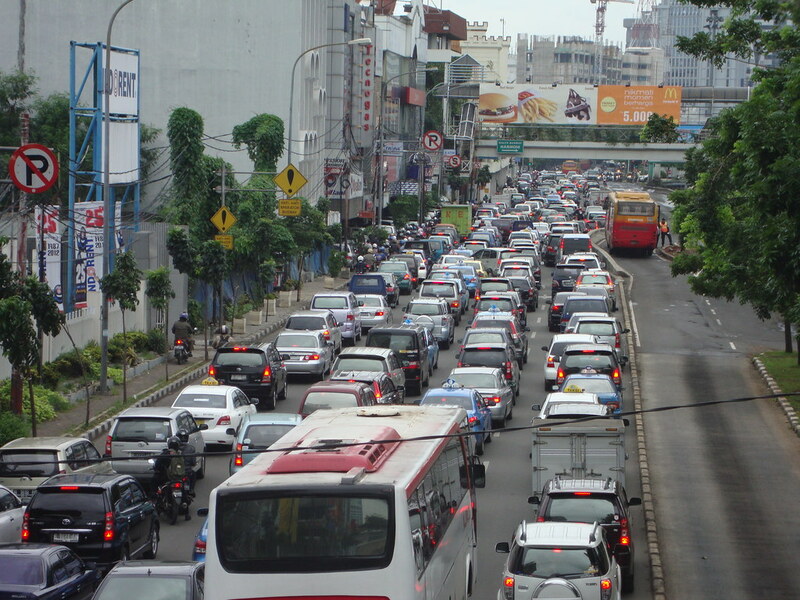 “There’s no space on the road,” transport ministry spokesman Hemi Pramuraharjo said. “We don’t have a solution. There is a bottleneck there, where there’s a petrol station very nearby and many people queue,” he said. The toll junction at Brebes has earned the nickname Brexit, combining Brebes and exit. Achmad Yurianto, a spokesman for the ministry, said the heavy use of air conditioning could also lead to an increase in carbon dioxide levels in people’s cars. Jakarta’s population largely abandons the city to celebrate Eid, adding to the capital’s already woeful traffic problems. More than 400 motorists died across Indonesia during the holiday season. Java is home to more than half of the 255 million Indonesians. One civilian died in January’s botched gun and bomb attacks on Jakarta resulting in global, 24-hour news coverage, but mass slaughter on the roads occurs in a predictable cycle but very little media attention is paid. The media does, however, like deaths in the air and at least three flights in Indonesia have reported “disturbances” after almost coming into contact with giant balloons released as part of the Eid al-Fitr celebrations, a website reported. “Adi Sutjipto air traffic control reported at least three disturbances to flights due to the release of balloons on Saturday,” airbase spokesman Major Sus Giyanto told Tempo.co. An AirAsia pilot flying from Yogyakarta to Kualanamu route reported that his plane nearly collided with two balloons flying 10 metres away at an altitude of around 18,000 feet. Another balloon was reported at around 30,000 feet. Crew of two Citilink aircraft reported similar sightings north of Surakarta. The balloons, powered by fire and measuring 5 metres in diameter and 10 metres in height, can reach up to 35,000 feet. Adi Sutjipto airbase operations chief Colonel Indan Gilang Buldansyah called on people not to release the balloons during future celebrations.